Macys gives their customers one year to return an item. They will accept returns or exchanges as long as your item is in good condition and within one year of purchase — that’s 365 days to make sure you’re completely satisfied. Some restrictions apply and are posted in certain departments. With either your original receipt, the credit card you used to purchase, your return label or packing slip, you’ll get a complete refund in the original form of payment. It was a gift: If you have a gift receipt, a return label or a bridal registry number, you’ll get a complete refund in the form of a store credit. You don’t have any proof of purchase: No problem! You may still be eligible for store credit for the item’s lowest selling price within the last 180 days. Please Save Your Receipt for returns or adjustments. Macys will accept for exchange or return merchandise if you are not happy. Some restrictions of course may apply. 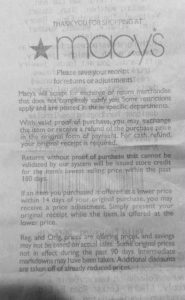 With your receipt, you may exchange the item or receive a refund of the purchase price in the original form of payment. For cash refund, your original receipt in required. Returns without proof of purchase that cannot be validated by their system will be issued store credit for the items lowest selling price within the past 180 days. If an item you purchase is offered at a lower price within the 14 days of your original purchase, you may receive a price adjustment. Simply present your original receipt with the item that is offered. Preference furniture returns must be returned in “as new” condition. If you notice any damage within 3 days of your delivery, please notify Macy’s Customer Service. At that time, we will schedule a service appointment to correct the issue. For more information, please call 1.888.822.6229. Don’t love it? You’ve got a whole year to bring it back. We’ll gladly accept returns or exchanges as long as your item is in saleable condition and within one year of purchase — that’s 365 days to make sure you’re completely satisfied. Some restrictions apply and are posted in certain departments. You have proof of purchase: With either your original receipt, the credit card you used to purchase, your return label or packing slip, you’ll get a complete refund in the original form of payment.